How Do the Mysterious Floating Balls On This Watch Work: Sorcery? If you want to slap a hefty price tag on a watch, fine craftsmanship and precious jemstones don't cut it anymore. 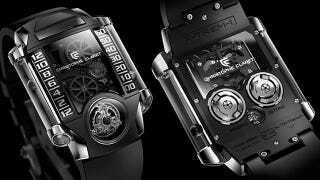 You need a gimmick, like a sprinkling of moon dust, or the magical floating balls in Christophe Claret's new X-Trem-1. As you've probably already figured out, the secret, sadly, isn't magic. Instead, the hollow metal balls appear to float inside a set of sapphire tubes—indicating the hours and minutes—thanks to a hidden magnetic carriage inside that's driven by thin but strong silk threads.